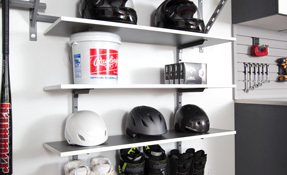 Our garage shelving in Fort Wayne is our most popular storage solution. 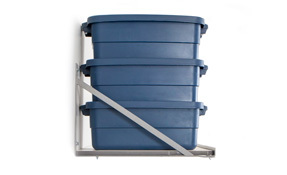 With layered storage and a variety of accessories, it's possible to create a storage solution that works for unique storage goals. 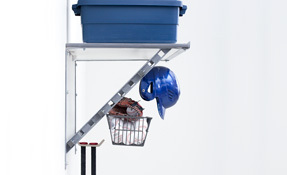 Made with industry-leading materials, our garage shelving in Fort Wayne can hold up to 1,000lbs on every 4ft section without bowing or breaking. Our shelves will keep your belongings safe and secure for as long as you need with our warranty. 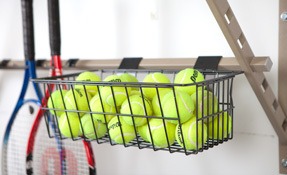 The bars and hooks below our garage shelves can be moved and adjusted to create the storage that you need. 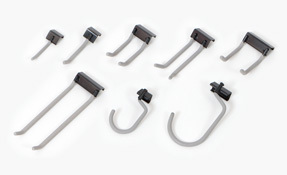 We offer a variety of hook and accessory options to add to any shelving system. 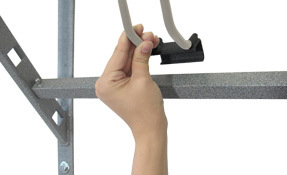 Our Monkey Bar garage shelving in Fort Wayne will help solve your garage storage problems. 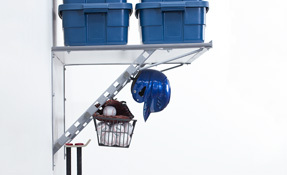 Our garage shelving can lift more, last longer, and store more than any of the competition. 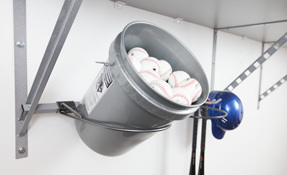 Custom storage with Monkey Bars garage shelving can help you with any of your storage needs with a variety of options. 24-inch Garage Shelving: Our 24-inch wide shelves are held six feet above the floor and can hold up to 1,000 pounds every four feet. 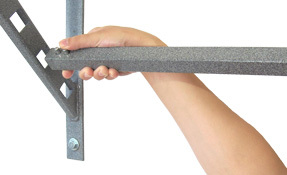 Wall Mounted Shelves: If you have space above your windows or doors, we recommend using wall-mounted shelves. They are installed above windows and doors, providing you with a way to make use of the extra wall space in your garage. 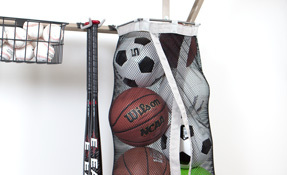 Custom Accessories: We have a variety of accessories from hooks to wire baskets and ball bags to complete your custom storage system. 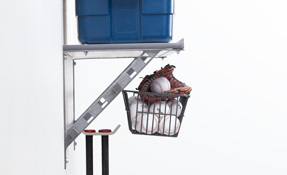 Monkey Bars garage shelving will help you organize your storage to make your garage spacious, organized, and beautiful. We offer top of the line products that can hold up to half a ton in your garage and help you get the room you’ve always wanted. Do you have to park outside of your garage due to the amount of stuff on the floor? Are you tired of having to dig through boxes and piles to find items that you need? 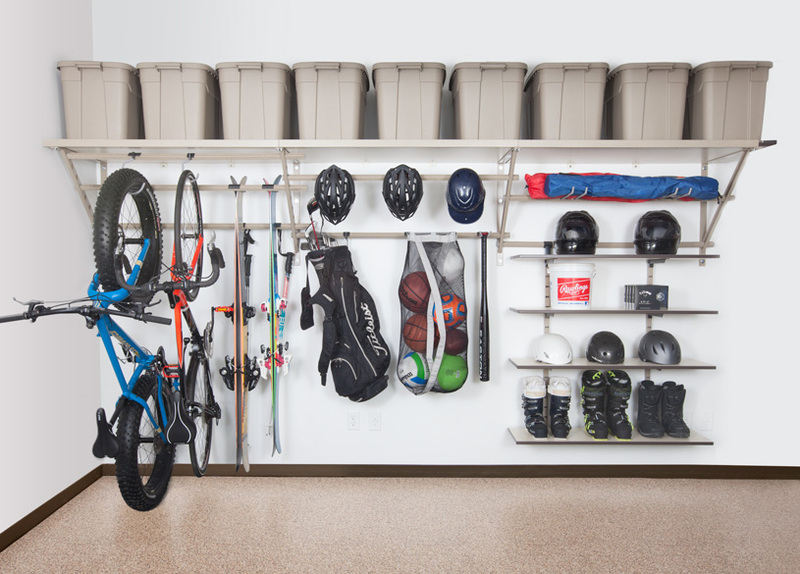 Efficient: Our storage can hold up to three times the amount of other garage shelving and storage systems, allowing you the space you need. 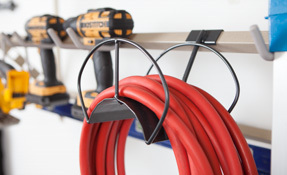 Versatile: Our garage shelving and storage system uses a variety of hooks to help hang and store any tool or toy you need to keep safe and off the floor. 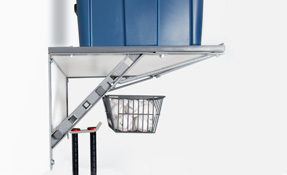 Affordable: Our systems run at one-third of the cost of similar garage storage systems. 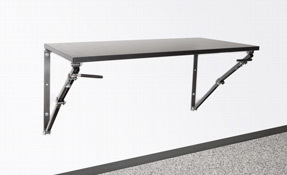 Store 1,000 pounds without hurting your wallet. Our system has been featured on HGTV: Property Brothers and Extreme Makeover: Home Edition. Call us today to find out why! 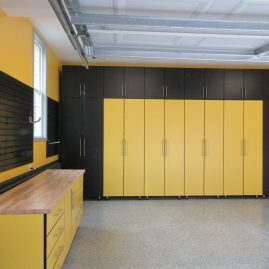 If you’re ready to transform your garage into the ultimate efficient organization, garage shelving in Fort Wayne is a great way to start!